Group Size: Departs Daily on Request during Special Season of NOV 15 - MAR 31. The Five Rivers Safari Special is a great opportunity to experience the delights of Botswana’s Luxury Tented Camps at an amazing rate. Small camps that offer a game and wilderness experience you will never forget. 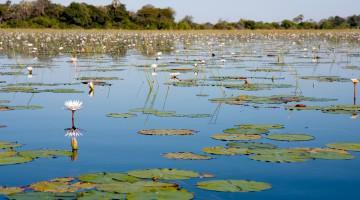 This trip features the magic of Victoria Falls and the majestic Okavango Delta. Staying in small and intimate camps set amongst the heart of the Delta, your safari options are plentiful including game drives, game walks, mekoro excursions, boat trips and even fishing! The small nature of these camps makes this one truly romantic experience! On arrival in Vic Falls you will be met and transferred to the Batonka Guest Lodge. This evening you will embark on a sunset cruise to enjoy the sights and sounds of the Zambezi River and marvel at the beauty of an African sunset. You may have the opportunity to see a variety of game; including hippo, crocodile, elephant as well as enjoy the many different bird species. The sundowner cruise includes finger snacks, beer, wine, local spirits and soft drinks. Return to your lodge for dinner and overnight. After breakfast a guided tour of Victoria Falls, one of the seven natural wonders of the world. Walk through the magnificent rain forest where you are able to view the largest falling sheet of water on earth, Livingstone’s statue and a wide variety of birds and plants. This afternoon you may wish to undertake one of the many optional activities available such as Helicopter flights, Elephant interaction, game drives and more. Today after breakfast you will be transferred to Kasane for your 60-minute flight to Lagoon Airstrip. The flight is a highlight in itself as you fly over one of the world’s most amazing ecosystems and spot wildlife from the air. You will be met on arrival and transferred to Lagoon Camp for three nights. Lagoon is perched on the banks of the wild Kwando River, nestled beneath towering ebony and marula trees. The heavily forested site is home to a wide variety of birds and mammals, while elephant and hippo are normally visible from the camp. The stunning views and close proximity of wildlife all contribute to the pervading sense of calm at Lagoon. The Lagoon area has a well-earned reputation for big game and large herds of elephant and buffalo, especially in the winter months, when herds of up to a thousand are not uncommon. This vast concentration of game attracts the attention of large predators. The Lagoon wild dog pack regularly den close to the camp and the excellent viewing opportunities have led to Lagoon’s reputation as the place to see wild dog in Botswana. Seasonally large herds of elephant drink at the river bank near to the camp in full view of the main deck, while playful spotted – necked otters are commonly seen performing in the water. Custom game vehicles comfortably seat maximum of six guests in three rows of three seats at all our properties. Guests are guided by a two person team, enabling the guide to communicate points of interest while the tracker ensures no sightings or tracks are missed. Night drives are a Kwando Safaris specialty. Beginning in the late afternoon as the sun sets, the African day is transformed into a soft colourful evening canvas; unexpectedly revealing the creatures of the night! While game vehicles traverse much greater distances, nature walks inspire, humble and afford a remarkable appreciation of Africa’s natural environment. Your eyes will be opened up to a world of smaller plants, insects and tracks easily missed while in a vehicle. Game walks are not hikes, and are meant to be comfortable strolls providing you with a chance to experience the wilderness in all it’s beauty. The boat experience is soothing and relaxing as you drift along the river. Watch elephants bathe, gaze at a multitude of spectacular birds species or hear the snort of a territorial hippo! Double-decker boats are used to provide a better vantage point and offer a wonderful position to enjoy the waterways and their varied inhabitants. The Kwando River is as an excellent destination for fly fishing and traditional spin fishing. You can even fish from the main deck at Lagoon. Species targeted by sports fisherman are several species of tilapia (including the olive bream or nembwe, red breasted tilapia, purple faced largemouth and three spot tilapia), the sharp tooth catfish, African pike and the mighty Tiger fish. After an early morning game drive and breakfast you will be transferred to the airstrip for your short flight to Kwara Camp for two nights. Overlooking a secluded lagoon in the northern Okavango Delta, Kwara offers the ultimate Delta experience. Its location allows access to the permanent waterways of the Delta as well as expansive dry land areas, admired for their quality game viewing. Kwara is known for its consistent sightings of predators, including lion, cheetah, leopard and on rare occasion – white rhino! Herds of elephants also frequent the area, as well as giraffe, zebra, sitatunga, lechwe, impala and hippos. Custom game vehicles comfortably seat maximum of 6 guests in three rows of three seats at all our properties. Guests are guided by a two person team, enabling the guide to communicate points of interest while the tracker ensures no sightings or tracks are missed. Night drives are a Kwando Safaris specialty. Beginning in the late afternoon as the sun sets, the African day is transformed into a soft colourful evening canvas; unexpectedly revealing the creatures of the night! Watch elephants bathe, gaze at a multitude of spectacular birds species or hear the snort of a territorial hippo! Double-decker boats are used to provide a better vantage point and offer a wonderful position to enjoy the waterways and their varied inhabitants. 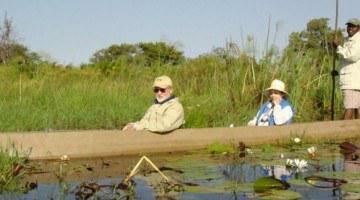 This traditional dug out canoe is surely the experience definitive of the Okavango Delta. The complete stillness of an early morning in the Delta is truly a sublime experience. Glide through its varied and unique waterways and floodplains in this traditional mode of transport. After a last early morning game drive and breakfast you will be transferred by light aircraft to Maun to connect to your flight onwards. Departs daily on request. Rates reflect seasonality. Airport transfers and between lodges including light aircraft, accommodation as indicated, all safari game drives/excursions and activities as indicated in the itinerary, meals as specified in the itinerary, local brand alcoholic drinks camps in Botswana, qualified Safari Rangers at each camp, laundry at camps in Botswana, all national park entrance fees. Flights, airport taxes, visa costs, meals not specified, optional excursions, drinks, mineral water, gratuities and personal expenses. Discount Information: Sale - Departures Nov 15 - Mar 31! Conditions: All travel must take place between Nov 15 and Mar 31. Batonka Guest Lodge is situated in the quiet residential suburb of Victoria Falls. We offer 22 rooms, each with bathroom en suite and a balcony, all on ground level and overlooking a beautiful garden. We have 11 pool view rooms – all of our pool view rooms can be twin or king rooms. The bathrooms have both a walk in shower and bath. These rooms have safes, wifi, tea/coffee station, fridge, TV’s and all amenities. We have 11 garden view rooms. All of these rooms can be twin or king rooms. The bathrooms have a walk in shower. These rooms have safes, wifi, tea/coffee station, fridge, TV’s and all amenities. 8 of these rooms are interleading rooms, perfect for families. Lagoon Camp lies on the shady banks of the Kwando River among tall and ancient African Ebony and Marula trees, under the watchful gaze of the resident hippos. Lagoon Camp was rebuilt in 2011 and can accommodate up to 18 guests in 8 luxury tents, one of which is a family unit. Lagoon is renowned for wild dog sightings and also the massive herds of elephant and buffalo which roam the area in the winter months. A safari paradise. 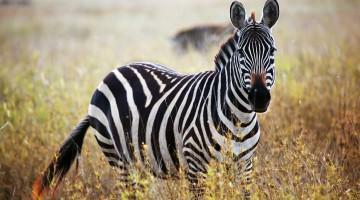 Activities offered here are game drives, day and night, guided walks and boat cruises. Each unit has a private veranda overlooking the river, a lounge area, raised bedroom, dressing area and a spacious bathroom with free-standing bath, indoor and outdoor showers and a separate wc. Kwara overlooks a secluded lagoon in the northern part of the Okavango Delta, within the magnificent 1,700 sq.km Kwara concession which borders the Moremi Game Reserve. With access to both the permanent waterways of the Delta and expansive dry land areas, a range of activities are available including game drives, night drives, mokoro and motor boat excursions, nature walks and seasonal fishing. Kwara is admired for its quality game viewing with consistent sightings of predators, including lion, cheetah, and leopard. 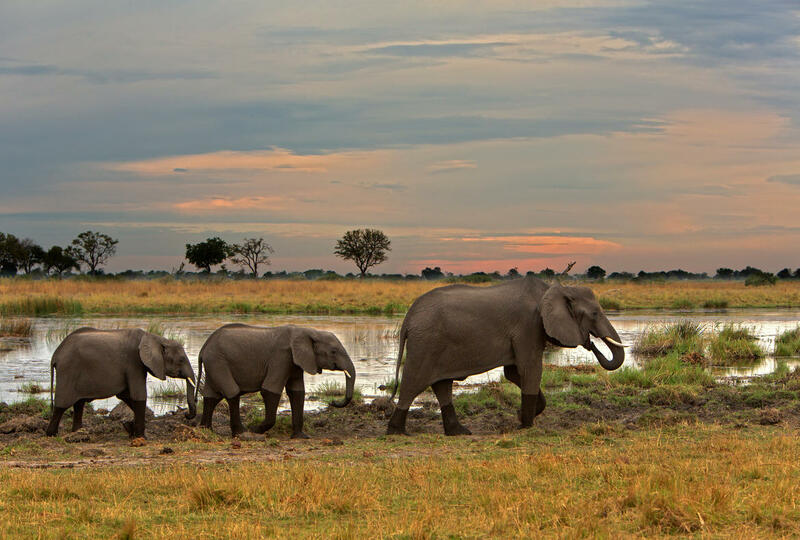 Herds of elephants frequent the area, as well as giraffe, zebra, sitatunga, lechwe, impala and hippos and the lagoon is known for its abundant varieties of birdlife. Kwara has a more rustic ‘vintage safari’ feel than other Kwando properties and the 8 meru style tents are each situated on a private deck with verandah overlooking the seasonal floodplain or lagoon. All are en-suite with flush toilet, double sinks and outdoor shower. The honeymoon tent also offers a free-standing claw-foot bath. The main area has a plunge pool, bar, lounge and hide. Towards the lagoon is the fireplace, a communal point where a light breakfast is served before heading off in the morning and stories are told after supper in the evenings.